FARMERS in Australia operate in a highly variable environment, and agriculture is considered the most volatile sector in the Australian economy. In fact, the volatility of the agricultural industry is nearly double that of any other industry in the country. With variability and volatility comes risk. Unfortunately, in life, there is rarely a reward without taking a degree of risk. In farming, risk is an essential part of generating income. Managing risk is about making business decisions that exchange some level of tolerable risk for some degree of acceptable return. Decisions can be made to decrease risk, but that can often result in lower revenues. To effectively manage risk in their business, grain producers need to understand both the downside and the upside of taking certain risks. In other words, they need to appreciate the potential harm, or cost, of taking a risk and the opportunities that taking that risk can offer. Weather is commonly regarded as the foremost risk faced by Australia grain farmers. However, the list is long and includes, but is not limited to, production risk, price risk, geographical risk, political risk and credit risk. Diversification in crop type, enterprise mix and property location are three common strategies used to manage income volatility due to production, price and geographical risks. The need for management of credit risk has been highlighted in recent months with the failure of two grain trading companies on the east coast of Australia in the first quarter of 2019. In each case, market participants are owed many millions of dollars, and grain growers are amongst the creditors. It is estimated that the grain production sector in Australia has lost more than $50million in recent years due to the insolvencies of a range of traders across the country. While this is small compared to the gross value of grain production over the same period, it has had an enormous impact on many individual farm businesses who have been forced to write off large sums of money due to the defaults. Unfortunately, the incidence of insolvencies in the grains industry tends to increase following droughts due to higher grain values and increased price volatility. They also have a habit of occurring in multiples as trading companies are exposed to each other in trade strings and there can be a domino effect when one becomes insolvent and unable to pay their debts. 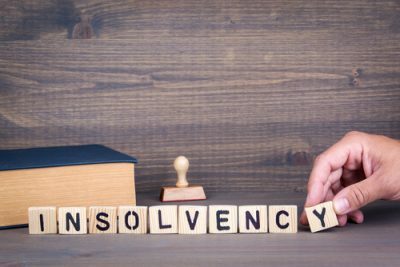 When a company is declared insolvent, there will be secured and unsecured creditors. A secured creditor is someone who has a security interest such as a mortgage or a charge, over some, or all, of the company’s assets, to secure a debt owed by the company. Unsecured creditors rank lower in priority than secured creditors as they have no ‘security’ over company assets. In most cases, growers exposed to insolvency will appear on the list of unsecured creditors. Unsecured creditors are at the bottom of the pecking order when it comes to distribution of funds in the liquidation process. In many instances, growers increase their credit risk by chasing the extra dollar. It is quite understandable that sellers want to maximise their return, but sometimes that extra dollar is just not worth the risk of default. For example, payment default on a 40t b-double of grain at $300/t equates to $12,000. Say the seller’s total grain production is 6,000t, that equates to $2/t across total farm production. And that is only one load of grain. Quite often the exposure is multiple loads as contracts are often for many hundreds of tonnes. So how should grain growers manage credit risk? Selling grain to multiple counterparties will help to spread the risk. Selling grain to the ‘big end of town’ is also likely to reduce risk. However, the best way for growers to mitigate counterparty risk in the Australian grain industry is to take out credit insurance when selling grain. Credit insurance basically protects growers against insolvency and non-payment by the buyer. It provides the seller with peace of mind with regards to counterparty risk. In most instances, such credit insurance policies guarantee the seller 90 per cent (pc) of the value of the grain being sold. That is an enormous reduction in financial risk exposure for a grain producer, especially when margins are continually being squeezed by increasing costs. If we continue with the example above, the credit exposure on the b-double load of grain falls to just $1,200, or $0.20/t across total farm production if credit insurance is in place. An extremely small price to pay for the certainty of receiving payment for 90pc of the value of the sale. The most convenient and cost effective way for growers to access credit insurance is via their grain broker. For growers that don’t use a grain broker, or use one that doesn’t offer the insurance option, then now is the time to seek out a grain broker that does offer the credit insurance option as part of their brokerage fee. In time, such insurance could well become a requirement of farm finance providers to manage their risk and exposure to the Australian agricultural sector. It could even have a cost of money benefit for the borrower. Nice article – however the best way to mitigate counterparty risk in the Australian grain industry is for sellers to not lose title of their grain until payment is received! As an industry we want to encourage competition whilst protecting the seller. Hence why Clear Grain Exchange has secure settlement. Sellers don’t lose title of their grain until funds are secured and the process is completed within 7 business days. All buyers can participate, they just need to adhere to the terms of the exchange. Thanks for your comment, Nathan, about there being more than one way to achieve security. Insolvency all too often has caused a supplier to be out of pocket for delivered grain and it does not need to be, if the contract can include fail-safe title transfer terms and minimise sellers’ exposure. Cheers, Ed.